When two brands with the same passion for design excellence come together, great things happen. 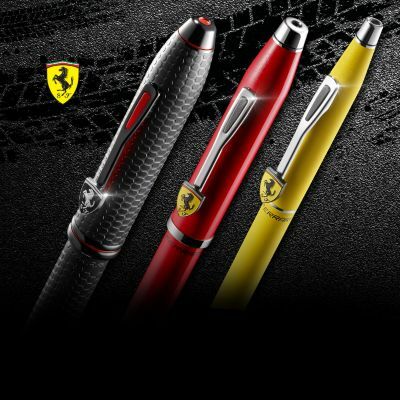 Cross has partnered with Scuderia Ferrari on a line of fine writing instruments and gift sets designed to bring the spirit of Scuderia Ferrari, the Formula 1™ racing team, to life for its fans. Each collectible brings together Italian artistry with American craftsmanship, creating the ultimate statement of performance design. Welcome to the Cross family. May your new purchase inspire you to race toward all you pursue. Ferrari is a symbol of excellence, built to win on both road and track. This collection was created to bring this unique DNA to life through our three core iconic Cross collections, Century, Century II, and Townsend. Signature design details include a pen clip artfully crafted and layered with classic Scuderia Ferrari colors revealed both in profile view and through a perforated clip modeled after the nose and cockpit of a Formula 1™ car. Hand-polished finishes express the concepts of innovation and technology, reflecting the materials used in the vehicles themselves. Gift sets were designed to tap into the excitement of Formula 1™ racing, transforming everyday writing and notetaking experiences and offering a stylish way to carry and protect a fine Cross pen. The Formula 1 soul lives within each piece in this officially licensed collection. And like all Cross writing instruments, your new pen is covered by the Cross Lifetime Mechanical Guarantee.